Today, on Kert Semm's blog Recent Music Heroes (http://agier.blogspot.com/), a great review on Smorgasbord. ThanX alot, Kert!!! Oax and Yan is back - two crazy old man is back in Sweden. And, as a rule I do not care what the old musicians do: I do not care what Robert Fripp and Holger Czukay make even Morrissey, Brett Anderson, Jarvis Cocker and the `i` i no longer feel the case against public interest. But these two 60s though a passport with an interest is languid. They are representatives of the old school, born a few years after World War II, however, make many of today's musicians for the eyes, miserably. Men are vinged makers, as they have defeated the gang last year `s King Crimson, Pat accepted and Mastoletto küberpunkar Siratori Kenji (the latter is also represented on this album). 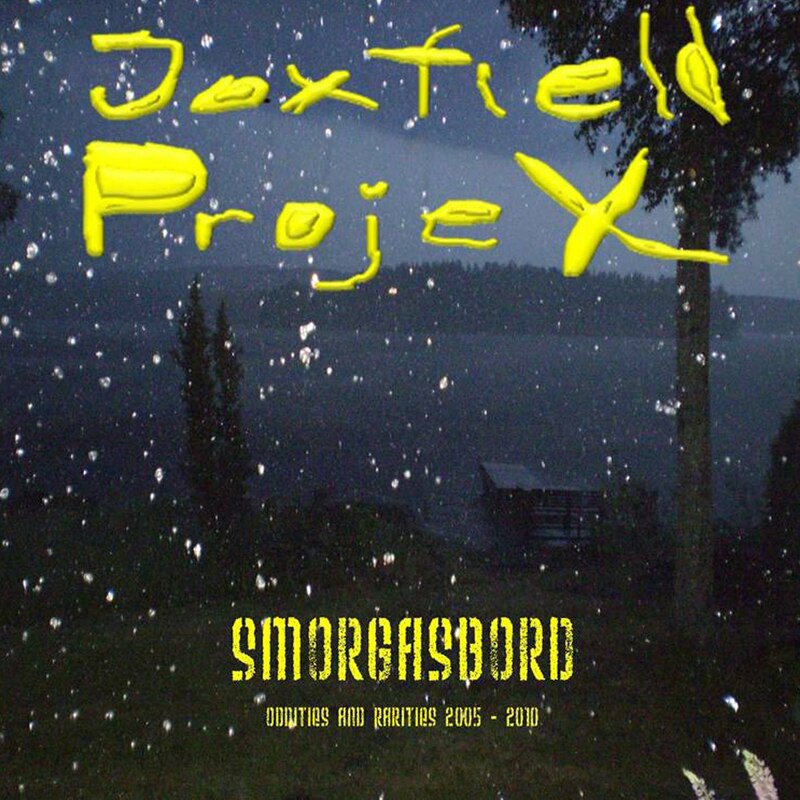 "Smorgasboard" is undoubtedly a writer for this year's expected reliis. And once again, expectations are gullible, breaking parimadki imaginations of listeners. 12 tracking period 2005-2010, which will focus on "the rarities and veidrustele". True, it is added to the relative tautological as to be familiar with the duo earlier creations. Again, balancing the spatial ekspansiivsuse, krautrock-kosmische `i` s psychedelic music, and hypnotic electronic lõpmatusemärgi flow between and after. And when we talk about infinity, I'm doing so great reputation. It makes no sense to highlight the separate compositions, in spite of the fact that they differ greatly - so elemental as the emotional angle. Just saund it is infinite, cosmic good. I do not know exactly what could mean a "cosmic good," but this album I think of it aimavat as saund is self-sufficient, and the transcendental. You just have to take time off and let the sounds of emotions, and spirit guide. And if you watch and record label Clinical Archives plaadiümbrist diskograafianumbrit `i (402), it seems to matter even more ulmelisem. Your Inner Outer space is our space. 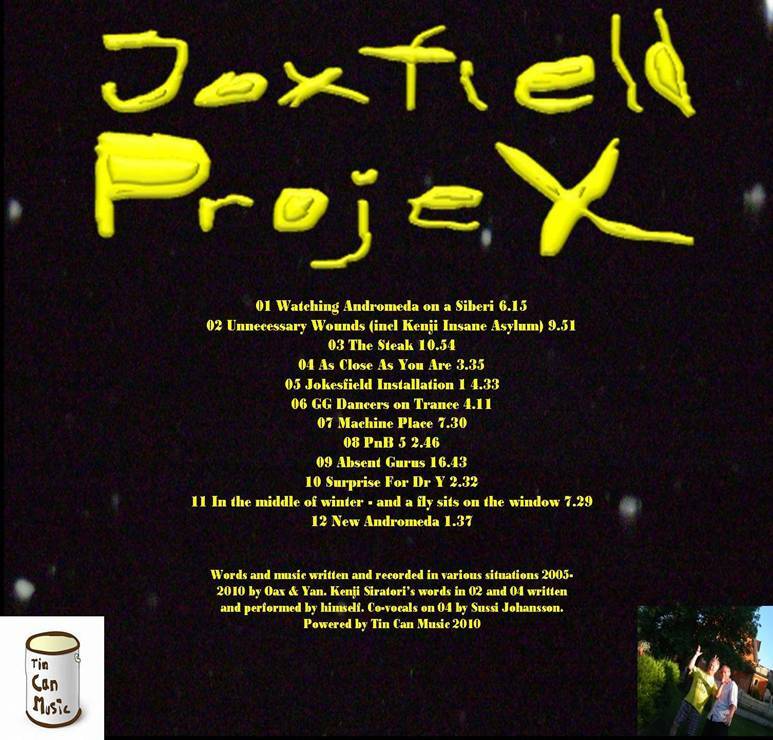 Joxfield ProjeX for dinner! Why not? 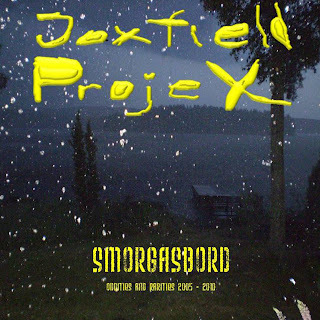 “Smorgasbord” is a collection of oddities and rarities from the five years of Joxfield ProjeX existence 2005 until now. These are tunes recorded mostly between album sessions, out of context, standing on their own feet. Some of them are radical remixes/re-makes of something released/not released during this period. And believe it or not, you’ll find Kenji Siratori as a spoken word crooner… Enjoy the meal! 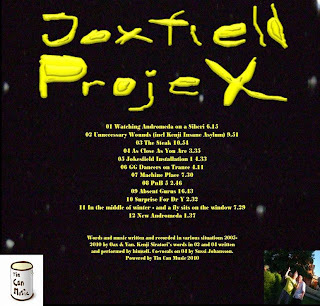 Oax: Guitar, glissando, vocals, samples, treatments, additional bass and percussion, innocence and naïvity. All words and music by Yan and Oax. Kenji's words written by himself.